Cody is the light of my life. 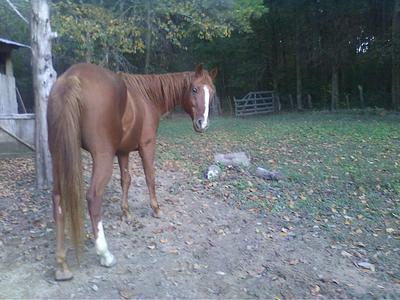 He is my sorrel Appendix gelding. He is not much, but to me he is everything. He's had quite the history. His former owners bought him when he was two. His reg. name is Ugottagetbehindme, sire The Face Behind The Line and out of I Gotta Faymas Face. They bought him for a barrel horse, but they kept him stuck in his stall for seven years, only brought him out to train or go to shows. He was nine when I got him, ten now. I went to look at him, and I thought he was gaited, because of the way he walked on gravel. His feet were bad looking, and he had no shoes on. He was not obese, but he was pretty round. They fed him well, he just never got to be let out to be a horse. We bought him for $1,000. Me? Happiest 10 year old in the world. I rode him that night, and later we realized his left eye was watery. We thought "Eh, it's just allergies from coming to a new place." But I wondered, how could he get it so fast? As the weeks went by it started to get worse. So we finally gave in and took him to our vet. He said that Cody had a cataract in his right eye, and a slit in his left. He said the left eye would get better with right treatment, but he would eventually go blind in the right one. I was worried, because I knew what usually happened to even half-blind horses. The vet gave him some meds and we left the right eye alone. And the weeks kept coming and it didn't get any better. We took him to the vet again, and he looked and said that Cody had a bacteria in his eye that was eating through the lens. He put a catheter on him and that night, me and my Mom slept in the trailer and got up every thirty minutes to squeeze medicine through the catheter. Sadly, our work didn't pay off. I came home from school one day after my Mom had taken Cody to the vet, frantic to hear the news. I expected it to be good. She said the vet had said that the bacteria had eaten through his eye, and the lens had popped, I believe she said. I cried for at least an hour, then took some carrots and went to see him. I was upset, because we are not one of those tie-a-bell to their neck people. If the horse goes blind, we put it down. I was worried for my beloved horse's life, even if I had only known him for about a month, he had my heart. We have carried flags together and been on trail rides, and he acts like he can see the whole world. Every day I come to the barn to see him at his gate, asking to be let out. Rain or shine, he will always be my beloved Cody. Comments for My Beloved Cody! I really hope Cody does OK. It sounds like you really care for him and he is lucky to be with you!